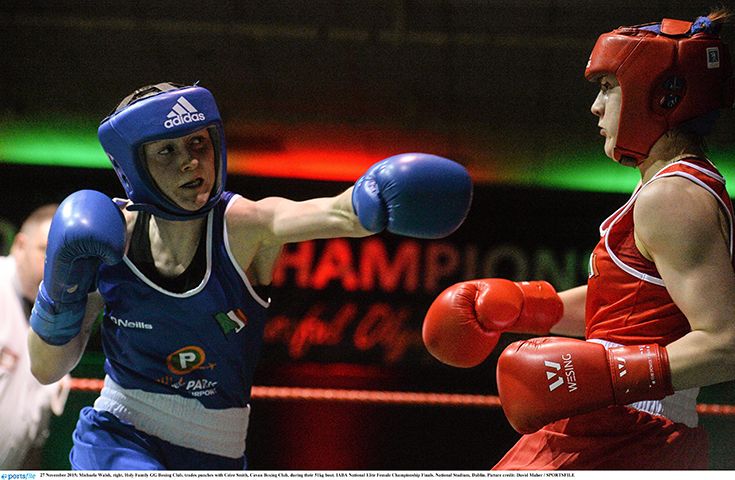 Smith beat out her opponent, Niamh Earley, in a 5-0 victory – a first victory at the Elites for a DCU boxer. Smith was one of the most experienced fighters on the night, and saw her taking part for the first time in two years. In the last Elite Championship, Smith lost to Michaela Walsh. A move to Australia for placement last year saw the Cavan native put boxing on the backburner, but upon returning home, she rekindled her love with the sport. Smith beat English 54kg champion Ramla Ali in London, which led her to take part in the Ulster Championship. Smith, a student of Sport Science and Health, previously competed in the World University Championships in Thailand where she narrowly missed out on a medal, placing 4th after a split decision with a French fighter. Returning to the home of Irish boxing, she added the National title to her already impressive CV after a dominant performance. In an interview with Irish Boxing, Smith said that she noticed the growth of women’s boxing in Ireland over the last few years. “Since 2012, it really has grown and right down at grassroots clubs are always improving, that’s why we are seeing the surge and the better boxers coming through,” said Smith. In previous fights, Smith felt she was pushing herself too much and not getting much enjoyment out of boxing. Smith recently made headlines after suing both her dentist and the HSE after a sharp instrument dropped into her throat in October 2013, an injury that hampered her future performance. Famous boxing coach Billy Walsh, was due to give evidence in the court case, saying Ms Smith would have qualified for Rio 2016 and was expected to get a medal, her counsel Michael J McMahon SC said. But the case was settled before Walsh gave evidence. The sharp object lodged in Smith’s body near her hip, and despite being passed fit to compete, suffered from severe abdominal pain. She was forced to miss the World Championships in 2014 after surgery to remove the object in September 2014, but now Smith hopes to compete in the Olympics in Tokyo 2020.